This paper describes a road area detection method using a support vector machine (SVM) and histogram of oriented gradient (HOG) features. The boundary lines have many features, such as changes in height, color, and brightness, but these are sensitive to noise. In terms of robustness, it is difficult to match road boundary lines with the boundary lines on 2D maps. Localization methods using texture matching are accurate, but they have disadvantages related to adapting to changes in the environment. We therefore decided to make a classifier to differentiate road areas from other areas by detecting the road plane. First, we calculate the HOG features from range data acquired by 3D LiDAR. We then create the road area classifier by applying SVM. Finally, we evaluate the basic performance of the proposed method in simulation and in the real world. K. Kazama, Y. Akagi, P. Raksincharoensak, and H. Mouri, “Fundamental Study on Road Detection Method Using Multi-Layered Distance Data with HOG and SVM,” J. Robot. Mechatron., Vol.28, No.6, pp. 870-877, 2016. D. Zhang, R. Kurazume, Y. Iwashita, and T. Hasegawa, “Robust Global Localization Using Laser Reflectivity,” J. of Robotics and Mechatronics, Vol.25, No.1, pp. 38-52, 2013. T. Suzuki, Y. Amano, and T. Hashizume, “6-DOF localization for a mobile robot using outdoor 3D point clouds,” J. of Robotics and Mechatronics, Vol.22, No.2, pp. 158-166, 2010. 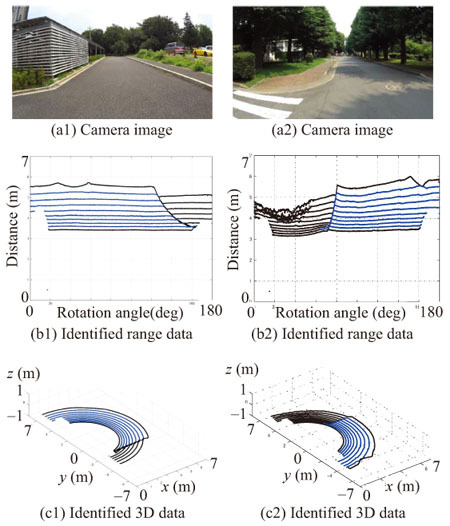 K. Ishikawa, Y. Amano, and T. Hashizume et al., “A Mobile Mapping System for Precise Road Line Localization Using a Single Camera and 3D Road Model,” J. of Robotics and Mechatronics, Vol.19, No.2, pp. 174-180, 2007. K. Yoneda, S. Mita, Y. Chenxi, H. D. Quoc, T. Hossein, and K. Muto, “Virtual Automated Vehicle System for Urban Driving Experiment,” Proc. of JSME TRANSLOG2014, pp. 289-292, 2014. K. Yoneda, H. Tehrani, T. Ogawa, N. Hukuyama, and S. Mita, “Laser Scan Feature for Localization with Highly Precise 3-D Map,” Proc. of 2014 IEEE Intelligent Vehicles Symposium, pp. 1345-1350, 2014. K. Hara and H. Saito, “Vehicle Localization Based on the Detection of Line Segments from Multi-Camera Images,” J. of Robotics and Mechatronics, Vol.27, No.6, pp. 617-626, 2015. J. Eguchi and K. Ozaki, “Development of Method Using a Combination of DGPS and Scan Matching for the Making of Occupancy Grid Maps for Localization,” J. of Robotics and Mechatronics, Vol.25, No.3, pp. 506-514, 2013. T. Ogino, M. Tomono, T. Akimoto, and A. Matsumoto, “Human Following by an Omnidirectional Mobile Robot Using Maps Built from Laser Range-Finder Measurement,” J. of Robotics and Mechatronics, Vol.22, No.1, pp. 28-35, 2010. K. Saneyoshi, “Drive Assist System of a Car by means of Stereo Vision,” Technical report of IEICE. PRMU, Vol.2013-CVIM-185, No.20, pp. 129-134, 2013. H. Date, M. Ohkawa, Y. Takita, and J. Kikuchi, “High Precision Localization of Mobile Robot Using LIDAR Intensity of Surface,” Trans. of the Japan Society of Mechanical Engineers, Series C, Vol.79, No.806, pp. 3389-3398, 2013. M. Omae and T. Fujioka, “Differential GPS-Based Position Measurement and Steering Control for Automatic Driving,” J. of JSME, Vol.65, No.634, pp. 211-218, 1999. N. Yamaguchi, N. Tamori, and A. Shiomi, “A Lane Detection Method Using Adaptive Edge Preservative Smoothing,” The Trans. of the Institute of Electronics, Information and Communication Engineers D-II, Vol.J88-D-II, No.8, pp. 1421-1431, 2005. M. Muramatsu, T. Kawata, and F. Kubo, “Traffic Lane Recognition by Image Segmentation and Object Recognition based on Rules,” Technical report of IEICE, PRMU, Vol.98, No.334, pp. 1-8, 1998. Y. Haramiishi, K. Kazama, T. Hioki, H. Furusho, and H. Mouri, “Study on the Edge Detection Algorithm Using Brightness Gradient Vector Applied to the Forward Road Image of the Vehicle,” Trans. of the Society of Automative Engineers of Japan, Vol.45, No.5, pp. 865-870, 2014. N. Suganuma, Y. Hayashi, and D. Nagata, “Path planning for intersection driving by autonomous vehicle,” Proc. of JSME TRANSLOG2014, pp. 293-296, 2014. N. Suganuma, “Trend and Example of Autonomous Vehicle,” The J. of the Institute of Electronics, Information, and Communication Engineers, Vol.98, No.1, pp. 48-53, 2015. T. Uozumi and N. Suganuma, “A Study of Precise Ego-Position of Autonomous Movement of Vehicle Using Map Matching Algorithm – First Report, Creating Lane Marking Maps Using Laser Range Finder –,” Proc. of the 2010 JSME Conf. on Robotics and Mechatronics, pp. 1P1-B11(1)-(4), 2010. K. Higuchi, M. Hebert, and K. Ikeuchi, “Building 3-D models from unregistered range images,” Proc. of IEEE Int. Conf. on Robotics and Automation (ICRA’94), pp. 2248-2253, 1994. M. D. Wheeler, Y. Saito, and K. Ikeuchi, “Consensus surfaces for modeling 3D objects from multiple range images,” 6th Int. Conf. on Computer Vision, pp. 917-924, 1998. K. Ikeuchi, “Modeling from Reality,” J. of the Robotics Society of Japan, Vol.16, No.6, pp. 763-766, 1998. K. Nishi and K. Ikeuchi, “Robust Simultaneous Registration of Multiple Range Images Comprising a Large Number of Points,” Trans. of the Institute of Electronics, Information and Communication Engineers D-II, Vol.J85-D-II, No.9, pp. 1413-1424, 2002. N. Dalal and B. Triggs, “Histograms of Oriented Gradients for Human Detections,” IEEE Computer Society Conf. on Computer Vision and Pattern Recognition 2005 (CVPR 2005), Vol.1, pp. 886-893, 2005. V. N. Vapnik, “The nature of statistical learning theory,” Springer, 1995. H. A. Suturges, “The Choice of a Class Interval,” J. of the American Statistical Association, Vol.21, No.153, pp. 65-66, 1926.